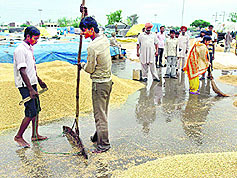 The continuing wet spell has put the wheat crop in Punjab and Haryana in jeopardy. Unseasonal showers accompanied by high-velocity winds and hailstorm have flattened the crop in some areas of the two states. 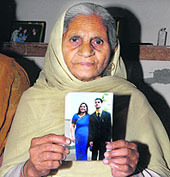 The death of a young Indian American in Fremont town, California, has shattered the dreams of his extended family settled in the city. It was border bonhomie at its best. 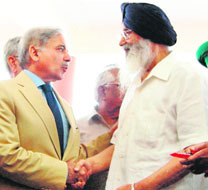 The inaugural ceremony of the country�s first Integrated Check Post at Attari witnessed an excellent show of camaraderie among politicians of the two countries as they cracked jokes and recited couplets during their addresses at the gala function. Haryana Chief Parliamentary Secretary and three-time MLA Ram Krishan Fauji was found unconscious under mysterious circumstances at his residence in Sector 12-A early morning here today. Warning of a grave law and order situation not only in Uttar Pradesh but across the country if the Dalit memorial parks were tampered with, former Chief Minister Mayawati today cautioned the Samajwadi Party government against attempting building anything in these parks. Joining her West Bengal counterpart Mamata Banerjee, Tamil Nadu Chief Minister J Jayalalithaa today attacked the Centre for its "arbitrary" action in reducing Central Sales Tax compensation to states by linking it with VAT rate revision.